After descending from the Amber Fort at Jaipur, we found a few people in the street to photograph. 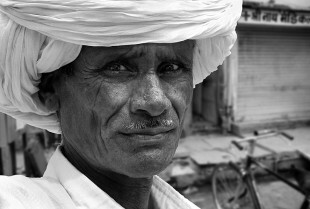 This gentleman was happy to have his photograph taken. Problem with such shots are the dark skin, the face in shadow and the sunlight on the white costume – it’s easy to lose detail. Careful manipulation of the RAW image and adjustment in Photoshop permitted acceptable detail to be retained in both the highlight and shadow areas. In the printed version, it’s possible to make out the fabric pattern in the turban. Otherwise known as Jal Mahal (“Water Palace”), this palace appears to float on the waters of Man Sagar Lake, just north of Jaipur. The lake was created in the 16th century after the construction of a dam to preserve drinking water. Jal Mahal was built in 1799 by Maharaja Madho Singh as a retreat for the royalty and was frequently used for their duck hunting parties! 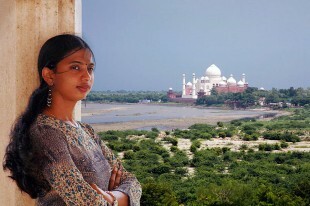 On returning from the Amber Fort to Jaipur, we stopped off to view the Summer Palace in the middle of Man Sagar Lake. There is a bus stop here and it is a popular tourist spot to take photographs of the abandoned palace. 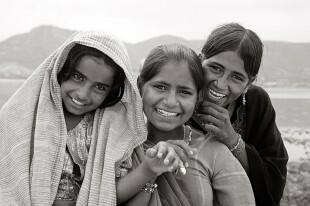 It’s probably why these girls were here – they knew tourists would like to photograph them in return for a few rupees. These are the steps leading up to the tomb. I wasn’t tempted to shoot the steps until the lady arrived and sat at the bottom. Unfortunately, there were one or two tourists at the top of the steps so I waited until they moved on. I changed to a wide-angle lens so I could include her in the scene without her being aware of me photographing her. She seemed to be suffering from the heat (it was 38 degrees that day) and so she took out a handkerchief to mop her brow. That was the moment to take the shot. It almost seems as if she is weeping at the tomb. 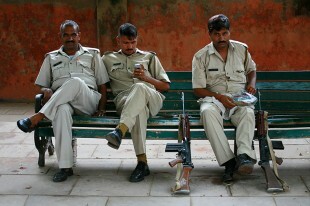 These guards were at in the street leading up to the entrance of the Taj Mahal at Agra. There had been some disturbances the night before (a curfew was imposed not long after this shot was taken) and these soldiers were relaxing for 5 minutes. It was very much a grab shot as I don’t tend to hang about too long when photographing anybody with weapons especially if there is a chance that their English might not be too good. A little Photoshop work was necessary to remove extraneous parts of other bodies in the shot. 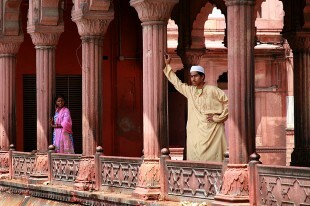 A corner of the Jama Masjid mosque in Delhi. I saw this figure standing there watching me take photographs. I considered it as an image but it wasn’t until the girl appeared further along the columns that I saw a balance to the shot that made me take it. It has needed a little work in Photoshop to restore some detail in highlit areas and to remove one or two distractions.